The tier 8 set bonuses are out. I originally intended writing a really whiny qq post about how much the priest ones sucked. Then common sense kicked in and I decided the four piece really has to be a place holder so for the time being I’m holding on to my really bitter thoughts about whoever came up with that idea. Priest T8 Healer 4P Bonus — Casting Power Word: Shield also grants you 15 spell power for until cancelled. The 2 piece is ok, although I would have prefered it on pretty much any heal bar Prayer of Healing. Prayer of Healing is too situational and too much of a mana hog to be spammed out all over the place. Which is probably why they put the crit on that spell rather than any of the more used ones (however, priests who now need lots of crit for mana regen, do get the lowest amount of any of the crit based healing class from talents), either that or Ulduar is going to be another Sunwell in terms of AoE damage. Although whilst raid buffed in my current gear I’m sitting around 27 percent crit as is, add 10 percent to that and 40 percent crit on Prayer of Healing shouldn’t be too hard to reach. Which makes the glyph of Prayer of Healing more tempting as well increasing PoH’s desirability as your go to AoE heal assuming you get to stand still whilst casting. The four piece on the other hand is hardly exciting even if we assume that 15 is missing a zero. Looking at our raid makeup for tier 8 content, it looks like we will be running with at least 1 disc priest in every raid, who naturally will be doing the bulk of the shielding, so I don’t really want to be in the position of casting a shield on myself every so often in order to grab a bit more spell power. Duration is also an issue, its unlikely to be as long as the shield is active as that will really vary depending on whom you cast it on. Suddenly shielding the tank would become pointless as one hit from a raidboss could knock it off, but shielding yourself 30 odd yards away who is taking no damage would be equally pointless but obviously for the opposite reason. Do you either use PW:Shield for its mitigation purposes or as a spell power trinket? If its until cancelled, then you would shield yourself as soon as you logged in and spend the rest of the day running around with the extra spellpower so that seems unlikely too. I really wish they wouldn’t release stuff until they had the numbers accurate or at least the mechanics sorted out and if thats the correct figure/wording I’ll be growling in a corner somewhere all day. Which leads to my big issue at the moment. Priests are the only healing class with 2 trees which whilst having the same role in raids, i.e. the prevention of deaths are so very different in their spell usage and methods for preventing said deaths. Which means every set bonus we get things which are fairly lame for at least one spec and in some cases both. Given that Holy and Disc really are very different, both in regards to the spells within the trees and the raid roles to which they tend to be assigned, I really wish that we could have 2 set bonuses, one for each spec. Obviously only one of the two could apply at any one point in time so it would have to linked to your current talents, but that way, we all stand a chance of getting something tasty, like for example the Prot warrior/Resto druid ones which seem fairly overpowered and spec defining. More cheerfully, it seems the new incarnation of Divine Hymn is completely overpowered and fully deserves its 6 minute cooldown. I’ve seen screenshots from the PTR (which I’m too lazy to download the current build of) showing 17k crits. Yay, but does this mean Tier 8 Hard mode content is balanced around having mulitple priests using some kind of Divine Hymn rotation? As much as I want to be overpowered, having a smart ability which can basically heal half a raid to full seems if I’m being a bit honest, a little over the top perhaps. Obviously we will have to wait and see, but in a guild like mine, where most of our healers are in fact priests…… trivial much? Mitts is now half way through lv 54. We spent 2 hours this morning running around Felwood and Winterspring, every single rare spawn was up and we saw a grand total of 5 people. No competition for any mobs, no threat of being ganked but somehow it was just too creepily quiet. Winterspring, empty or not, is still one of the prettiest zones in game. Mitts hit her 50th season today and picked up 2 new mini pets in the process (sprite darter hatching and robo chicken). I’m actually surprised at how much I’m enjoying leveling her. Compared to the Gnomeling’s evil enhancement shaman the difference between damage taken per mob is huge even though the difference in damage is minor. 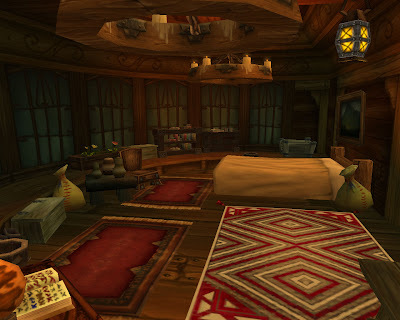 The vanilla wow content is so empty though, its rather sad, this is the first time ever that questing in STV we haven’t seen a soul, horde or alliance. Apart from that Shaman encounter I mentioned earlier, we haven’t even been ganked at all. A quick check of /who 10/50 proves there are plenty of people leveling, but the majority it seems are alts being powerleveled through instances and so Kalimdor and the Eastern Kingdoms are empty of all adventurers. In fact we have seen more lv 80’s running around doing their explorer/loremaster/seeker achievements than we have seen people of similar level. If we were leveling solo or had just bought the game, I think we would have found it rather depressing. 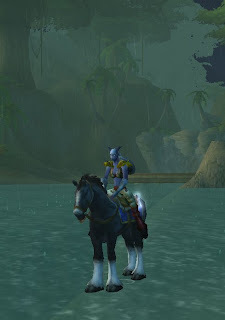 Mitts reached exalted with Stormwind this morning and got her bloodstained and sticky mitts on a beautiful black stallion. When I think of warriors I see the polished plate of medieval times, jousting (one of the reasons I’m loving the PTR so much) and damsels in distress, so the warhorse goes perfectly. Plus Hannibal might have crossed the Alps on an elekk err elephant but I’ll bet he didn’t have to contend with them constantly getting stuck in doorways. Stormwind and dainty Dalaran just weren’t designed with big hairy mammoths and elekks in mind. I was rereading a post on player housing the other day and it got me thinking. None of my characters are really city people, big towns and lots of people are great for day trips and shopping but not so good for hanging out in peace and quiet. So where would they like to hang their hats? Well Mitts found the perfect place whilst out questing the other day. Moored in Theramore harbour, there stands an empty ship. Flowering herbs grow in windowboxes, a bookshelf to hold the few (mostly unread) books she possesses and plenty of cupboard space for all that heavy armor. There is plenty of living space with extra chairs and tables, plus hammocks for any drunken overnight guests. The decks provide sunbathing space as well as room for a spot of fishing plus if the surroundings become too boring, there is always the option of uping anchor and sailing off into the sunset. Wonder what the penality for stealing a ship is in Azeroth? In the months since WotLK went live, I’ve only really been spending time on my priest. None of the 70 alts have even made it to 71 which is most unlike me. However in recent weeks I’ve been looking for something new ingame. Thus project M.I.T.T.S was born. Partly because I was struggling so much to get interested in leveling my shaman/druid or paladin I wanted to try something new. I was sure I didn’t want anything with a healing tree or a caster dps and rogues are skanky so that left deathknights or warriors. Currently you can’t move in Dalaran without falling over a deathknight and I hate the dirty ashtray look of their aoe so that left warrior. 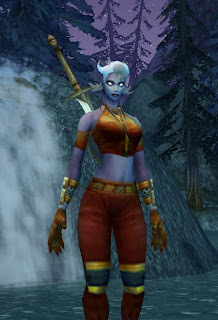 Now I know Night elves are the best alliance choice especially for tanking since the last racial reshuffle, followed by dwarves but when I closed my eyes and invisioned my little warrior, it wasnt a tall nelf or chunky little dwarf I saw, but a purple skinned, tail wielding alien creature. The plan is to level as prot, primarily to minimise downtime and so I can make fools of any melee dps wishing to pick a fight. On a side note, the name has more to do with my inability to hang on to two mittens without a piece of string being attached than any exciting acronym.